You are here: Home / Today's Tip / Show Your To Love Fit Tip Daily – Send Us You’re Fit Tip Daily Photo and Win! Show Your To Love Fit Tip Daily – Send Us You’re Fit Tip Daily Photo and Win! We love all our readers! So we decided to launch a contest! Here’s how it works……. 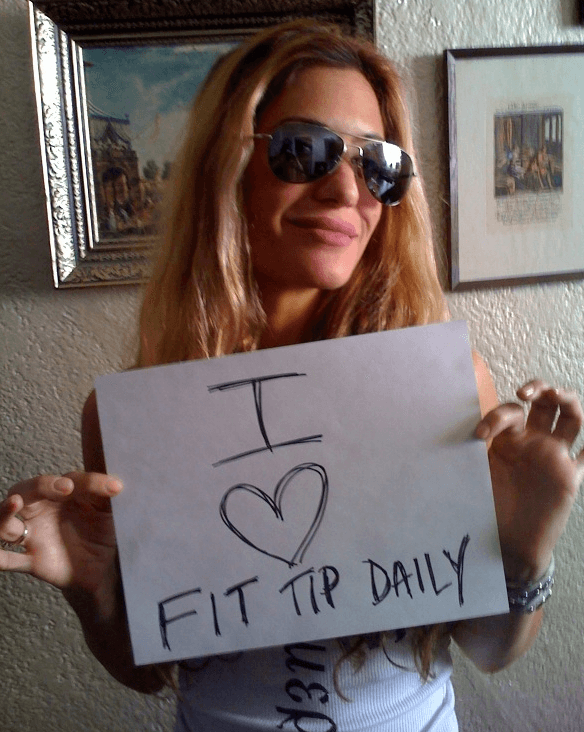 Rebecca Cardon From The Hit Bravo Show "Workout"
Take a picture of yourself holding a sign that says ” I love Fit Tip Daily…..” You can add anything after those words (if you’d like) so be creative!!! We will choose the top 5 photos as our winners. Each will receive a prize and one will win a grand prize. Creativity in location and in groups will get extra props! You Will Have Until April 16th to submit your photos. * If you love fit tip daily and you just want to show your love that’s also great!! We encourage any and everyone to send a picture! If you don’t want your face in the photo just take a picture of your body with the sign. Let’s start a web domino affect!! Support the site by posting the photo to Facebook, Pinterest and Twitter!! We love helping you one tip at a time!!! Pass this fitness tip onto you friends and family so they also have a chance to win!! When the deadline?! Great way to get peeps in the loop!